A female dancer at Constantinople. Ottoman empire. Home » A female dancer at Constantinople. Ottoman empire. 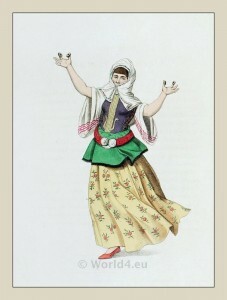 A muslim female dancer at Constantinople. Ottoman empire. ALTHOUGH both music and dancing are forbidden by the Islamic religion, these amusements are tolerated by the government. The female dancers, who are generally either young slaves, or the wives of Mohammedan musicians, hardly ever appear in public places. They go to the houses of individuals, where they dance, in the same way as the men, either alone, or in pairs. They are very loosely dressed; and their heads are always half covered with a veil. With castanets in their hand, and their eyes alternately languishing and piercing, they put themselves into the most free and voluptuous attitudes. There always are also in the houses of the great, as well as in the seraglio a certain number of young slaves, who are practised in dancing to amuse their mistresses as well as their masters. In these different amusements, however, there is nothing noisy or tumultuous. They are indeed restrained by the regulations of the police. which is very strict in this respect; and no person is allowed to have an entertainment with dancing and music, without permission of the magistrates. This entry was posted in 1804, 19th Century, Ottoman Empire, Turkey Costumes and tagged Dance costumes, Octavian Dalvimart, Ottoman Empire costumes, The costume of Turkey on 3/2/13 by world4.